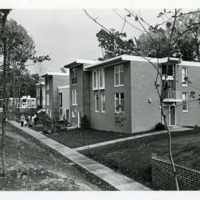 Photograph showing front of several town homes in Reston, Virginia. Residents and a child can be seen in front of one of the homes. 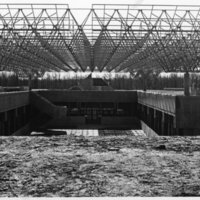 A segment from an oral history interview with Robert E. Simon originally conducted on December 1, 1986. 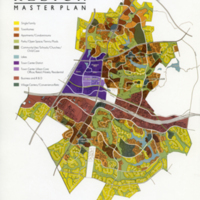 In the segment Simon discusses the concept of housing clusters. Total run time for the segment is 1 minute, 29 seconds. 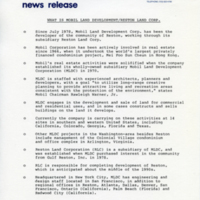 News release from Reston Land Corporation, the subsidiary of Mobil Corporation who developed Reston, Va. from 1978 until 1996. 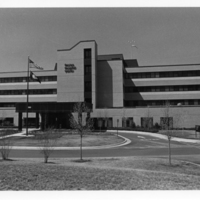 Details the company profile, activities, and chief executives. 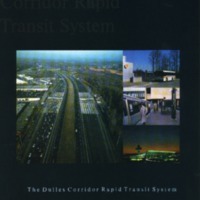 Illustrated color pamphlet describing planned measures for transportation in the Dulles Corridor beginning 1999. 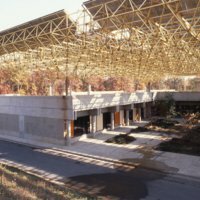 Measures include: express bus, bus rapid transit, enhanced express bus, and rail. 6 pages. 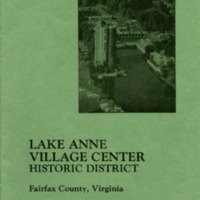 Pamphlet describing the nature of lakes in Reston, Va and proper use by the public. 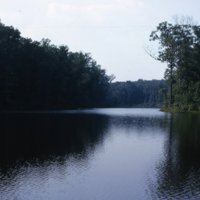 Details physical, biological, and ecological aspects of each lake and explains how the public can use the lakes for swimming, boating, and fishing. 21 pages. 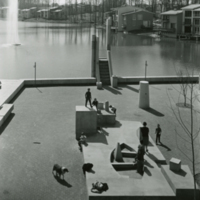 Children, accompanied by a parent and dog, play on the Gonzalo Fonseca sculpture, The Sun Boat, at Lake Anne Village. 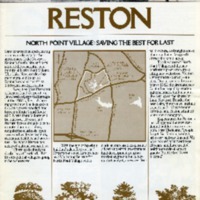 Slide showing a ground level view of Lake Newport in the North Point Village area of Reston, Virginia. 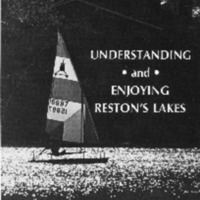 Image shows homes and sailboats on the lake. 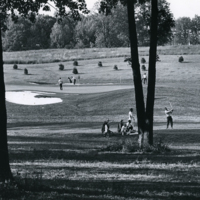 Slide showing a ground level view of Lake Elsa (now known as Audubon) in August of 1965. 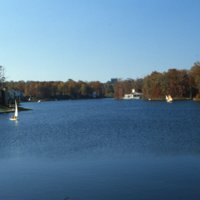 Prior to being renamed "Elsa" the lake was called Snakeden Lake. 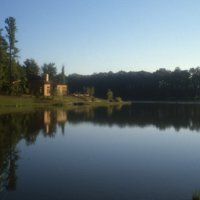 Slide showing a ground level view of Lake Thoreau, its shoreline, and homes. 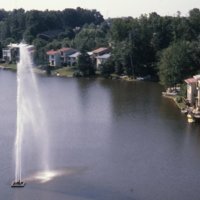 Aerial view of Lake Anne showing the fountain and Lake Anne VIllage town houses to the rear. 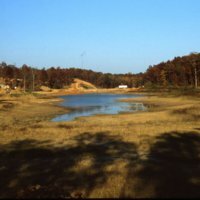 Slide showing a ground level view of Lake Audubon at a stage at which this section is not completely filled with water. Some home construction is evident on the north bank. 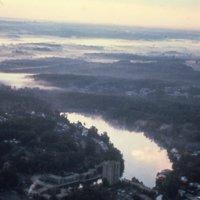 Aerial view of Lake Anne and Lake Anne Village from the northeast. 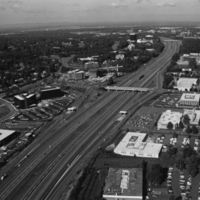 Washington Plaza and Heron House can be seen at the bottom of the image. 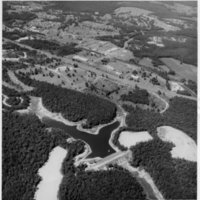 Aerial photograph of Lake Thoreau and dam. 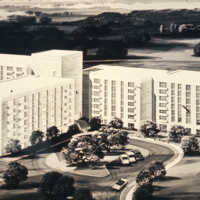 35 mm slide of a rendering of the Fellowship House retirement apartment complex at Lake Anne Village in Reston, Virginia. 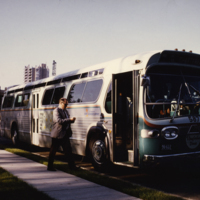 Color photograph of a Reston commuter bus picking up a passenger during the early to mid 1970s. Lake Anne Village Center and Heron House is visible at the left, just behind the bus.